Vietnam’s VietJet Air has started to pursue a pan-Asia LCC group strategy, initially establishing a joint venture affiliate in Thailand. If successful, VietJet could climb up the rankings in the dynamic Southeast Asian LCC market, where it now accounts for a tiny 2% of capacity. But the risks are high as the Southeast Asian LCC market is already highly competitive, with 22 carriers and several more in the works. The planned launch of Thai VietJet and the pursuit of joint ventures in other ASEAN countries represent an ambitious move given that VietJet is only 18 months old. VietJet has quickly established itself in Vietnam but its brand is an unknown in other parts of Asia, which will make it a challenge to overcome the first mover advantages of AirAsia, Jetstar, Lion and Tiger. In its first venture, in Thailand, VietJet will face stiff competition from two well-established LCCs, Thai AirAsia and Thai Airways affiliate Nok Air. Lion also plans to launch a joint venture in Thailand, a market which is growing but is unlikely able to support so many LCCs. VietJet on 26-Jun-2013 announced the establishment of new joint venture carrier Thai VietJet, which is expected to launch in early 2014 with an initial fleet of two or three A320s. VietJet will have a 49% stake in the new carrier while the remaining 51% will be owned by the parent of Thai carrier Kan Air. Kan Air is a tiny and little known airline, operating single-engine 12-seat Cessna Caravans on four routes within northern Thailand. But its parent Kannithi, which also owns a debt collection firm, and VietJet’s main shareholder Sovico, a major Vietnamese conglomerate, have the financial muscle to back a new player on Thailand's trunk routes. Thai VietJet is expected to initially serve Thailand’s three largest domestic routes – Bangkok to Chiang Mai, Phuket and Hat Yai. International services could quickly follow, potentially to neighbouring Myanmar, where VietJet is looking to establish another joint venture. VietJet already serves Bangkok Suvarnabhumi, the first and so far the only international destination for the Vietnamese carrier, from Ho Chi Minh City and Hanoi. Thai VietJet will have to overcome intense competition in all of its initial routes. Nok and Thai AirAsia have a strong position in Thailand’s domestic market, accounting for 53% of seat capacity. Most trunk routes are also served by Thai Airways and full-service boutique carrier Bangkok Airways. Small low-cost/leisure carrier Orient Thai also serves the Bangkok-Chiang Mai and Bangkok-Phuket markets. Orient Thai was previously a major domestic player through its now-closed LCC subsidiary One-Two-Go, but has significantly decreased domestic capacity over the last several years as it has struggled to compete against larger Nok and Thai AirAsia. This highlights the challenges any new entrant in the Thai market will face. As previously reported by CAPA, Indonesia-based Lion is also preparing to launch an affiliate in Thailand with a still un-named partner. Nok and Thai AirAsia both have strong local brands and distribution networks. They are also now accelerating expansion using proceeds from initial public offerings, which will make it even more difficult for Thai VietJet and Thai Lion to carve out sustainable niches. Neither Lion nor VietJet have established brands in Thailand. VietJet has only served Thailand since Feb-2013 while Lion currently does not have any services to any destination in Thailand. Kan Air is also not a well recognised brand in Thailand given its limited network. As it operates aircraft with less than 19 seats Kan Air could be considered more an air taxi operator rather than a regional airline. Kan Air could potentially feed Thai VietJet in Chiang Mai in an attempt to duplicate the strategy used by Nok, which serves regional markets with its own 66-seat ATR 72s and 34-seat Saab 340s that are operated by a partner under the Nok Mini brand. But Kan Air would need to upgrade its fleet to larger twin-engine turboprops and move into larger regional routes to effectively feed VietJet. Of Kan’s four routes, only Chiang Mai to Me Hong Son is also served by Nok. The other three are not currently served by any other carrier although two of Kan’s other destinations, Nan and Phitsanulok, are served by Nok from Bangkok while Kan serves them from Chiang Mai. Kan Air backing Thai VietJet could help expedite the process of securing approval from Thailand’s Department of Civil Aviation. Thai Lion may also partner with one of Thailand’s smaller carriers to help expedite its launch. But Thai Lion will have a potentially big advantage over Thai VietJet in that it will be able to leverage Lion’s huge order book for new aircraft – including 737s, A320s and ATR 72s – and economy of scale. VietJet has so far leased all its aircraft and not placed any orders. VietJet is also too small to provide new affiliates with the economy of scales for purchasing other items, such as spare parts or maintenance, and the network synergies that come with being a member of a large group such as Lion, AirAsia, Jetstar or Tiger. VietJet currently operates eight A320s and plans to add two more by the end of 2013. About 10 more A320s are expected to be added in 2014, with some aircraft allocated to Thai VietJet and potentially to a second new joint venture in Myanmar. AirAsia, Lion and Jetstar all have over 100 aircraft in their groups and have locked in low rates as well delivery slots for additional aircraft. VietJet’s growth hinges on its ability to source aircraft from leasing companies at competitive rates. VietJet currently provides about 60,000 weekly seats across its network of 11 domestic and two international routes. This gives it only a 2% share of LCC capacity and a 1% share of total capacity within Southeast Asia. Even in its home market of Vietnam, VietJet only accounts for less than 8% of total capacity, according to CAPA and Innovata data. The Lion Group, which includes new and fast-expanding Malaysian subsidiary Malindo, currently accounts for about 35% of LCC capacity within Southeast Asia. The AirAsia Group accounts for a slightly smaller 33% share but has a more diversified portfolio that includes carriers in four ASEAN countries compared to two (soon potentially three) for Lion. AirAsia also has by far the largest international network among LCC groups in Southeast Asia as Lion is predominately a domestic operator with less than 5% of group capacity allocated to the international market. Note: For all groups only LCC subsidiaries and affiliates are included. For example, Batik is not included in Lion figure as it is a full-service subsidiary. Tiger, which has affiliates in three Southeast Asian countries, and Jetstar, which has affiliates in two Southeast Asian countries, account for 6% and 4% respectively of LCC capacity within Southeast Asia. Jetstar is the only group with a Vietnamese affiliate, Jetstar Pacific, which took over from the previously full-service Pacific Airlines in 2008 but has already been overtaken by the rapidly expanding VietJet. Jetstar Pacific currently accounts for only about 11% of domestic capacity in Vietnam and does not operate any international services. VietJet, which launched services in Dec-2011, currently accounts for over 14% of domestic capacity while Vietnam Airlines accounts for the remaining 75%. VietJet’s decision to start pursuing joint ventures outside Vietnam is somewhat surprising given the carrier’s relatively small share of its home market. Vietnam’s aviation market has huge potential and remains relatively under-served by LCCs. Vietnam has by far the lowest LCC penetration rate among the six major markets of ASEAN. Currently LCCs account for only 25% of domestic seat capacity and 14% of international seat capacity, according to CAPA and Innovata data. Thailand currently has a domestic LCC penetration rate of 55% and an international LCC penetration rate of 19%, making it a significantly more mature market. At this relatively early stage of its development VietJet should probably be focusing on further expansion in Vietnam and leveraging its position as the country’s largest LCC. But there are two factors which may be driving its strategy: firstly, opportunities for further market share growth, particularly domestically, may be limited given the regulatory environment; and more pertinently, as more new large LCCs/hybrids (such as Lion and India's IndiGo) address the pan-Asian market, the possibility of gaining a strong foothold will diminish as the others strengthen their positions. VietJet already serves nine of the 11 largest domestic routes in Vietnam. Most of the domestic routes it does not yet serve are still too thin to be served with 180-seat A320s, even factoring in low fare stimulation. Most of Vietnam’s middle class reside in one of three cities – Ho Chi Minh, Danang and Hanoi. Flights between these three cities currently account for about 30% of total domestic capacity in Vietnam. VietJet already has a high frequency service on the three routes connecting Vietnam’s three main cities, but unlike the leading LCCs in other domestic markets, it is unlikely VietJet will be able to surpass the flag carrier and control a majority of capacity on these key routes. 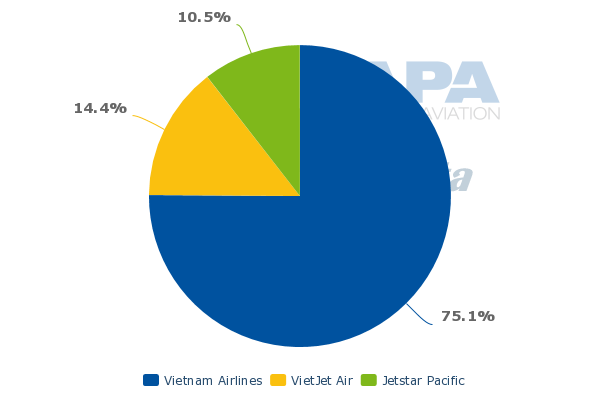 Vietnam's regulatory environment still favours Vietnam Airlines, which also owns a 70% stake in Jetstar Pacific. There should be more opportunities in Vietnam’s international market as VietJet has only scratched the surface with its daily Ho Chi Minh-Bangkok and Hanoi-Bangkok services, which were launched in Feb-2013 and Jun-2013. VietJet is currently evaluating potential service to Korea, Japan, Malaysia, Singapore, Taiwan and expects to launch more international routes by the end of 2013. But VietJet will face intense competition on international routes, particularly within Southeast Asia, against more established LCC groups. Inbound traffic dominates most of Vietnam’s major international routes, making it potentially difficult for an airline that does not have a strong brand outside Vietnam. VietJet’s delay in moving forward with Singapore, which the carrier initially aimed to launch in Jun-2013, could illustrate some signs of its unwillingness to contest already-competitive city pairs. Jetstar and Tiger each have three daily flights in the Ho Chi Minh-Singapore market, leaving little room for a third LCC. If the Vietnamese market is only able to support a relatively small LCC, VietJet could risk being squeezed out in the broader Southeast Asian LCC marketplace as competition continues to intensify and as open skies in ASEAN is implemented. Of the 22 LCCs based in Southeast Asia, only four are currently independent of larger groups – Cebu Pacific, Golden Myanmar, Orient Thai and VietJet. The other 18 are all affiliates with one of four LCC groups – AirAsia, Lion, Jetstar and Tiger – or are affiliated with major full-service airline groups. 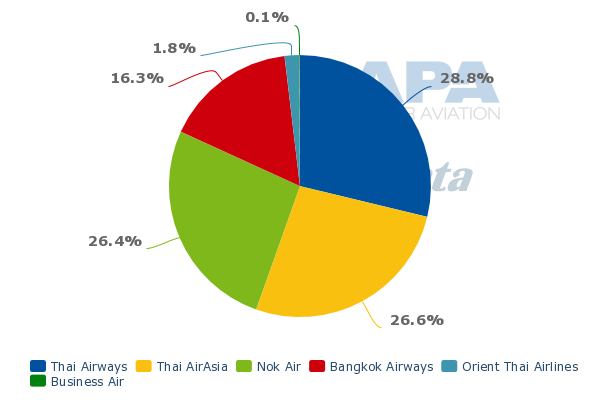 The four independent LCCs account for only about 13% of LCC capacity within Southeast Asia. Cebu Pacific is by far the largest of the independent LCCs, with a fleet of over 40 aircraft and capacity which accounts for about 10% of the Southeast Asian LCC market. Cebu Pacific is not interested in pursuing a pan-Asia LCC group strategy, believing the market is overly competitive and it is better off focusing on leveraging its leading position in the Philippines with further domestic and short-haul international expansion as well as a new long-haul division. This appears a sensible strategy for Cebu Pacific as it has already surpassed Philippine Airlines in the domestic market. The Philippines aviation market is only slightly larger than Vietnam’s market, but it is highly unlikely VietJet will be able to match the success Cebu Pacific has had in its home market, given the current environment in Vietnam. VietJet therefore may need to join forces with an existing group or try to form one on its own. VietJet during its pre-launch phase had been partnered with AirAsia but the Malaysia-based group pulled out because the Vietnamese Government refused to authorise VietJet to use AirAsia’s brand and website. While VietJet has re-looked at partnering with AirAsia and other LCC groups it would likely receive valuable favourable consideration from the Vietnamese Government if it instead looked to establish its own group and pursue overseas investments. VietJet boldly expanding internationally with a joint venture in Thailand is a significant milestone for Vietnam as a country and the ceremony in Bangkok announcing the project with Kan Air was attended by the Vietnamese deputy prime minister, illustrating the importance attached to the move – and a political endorsement of VietJet as a national airline. But the reality is the Southeast Asian market over the long-run may only be able to sustain three or at most four pan-regional LCC groups. VietJet is off to a great start in Vietnam but replicating that success in Thailand, where it will have to compete against two or three LCCs, will be no easy feat. Pursuing a pan-Asia strategy with potentially multiple joint ventures is a bold move for little known VietJet that could have huge rewards but comes with high risk.